Good news!! There is a way to buy reasonably priced jewelry without experiencing buyer’s remorse or emptying your bank account. Online jewelry stores such as Anjolee.com offer lower prices than boutiques. And with the click of a few buttons you can choose your type of metal, size, clarity, and even have a personalized message engraved. In other words, you can completely customize your jewelry from the convenience and privacy of your own home. I was only recently introduced to the concept of online jewelry personalization after a friend designed her engagement ring though an online site. She was able to select all the elements she wanted, and her future husband was happy to know she got the exact ring she wanted, while keeping within their budget. So back to holiday presents… For those who are wondering what to buy for their mom, favorite aunt, friend, sister, or cousin, how about a gold or platinum necklace? It is the perfect addition to any woman’s wardrobe, since it is useful, beautiful, timeless, ageless, and suitable for every occasion. 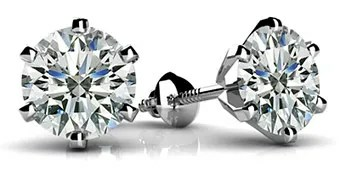 Another great idea is a set of diamond earrings. Diamond studs are classic and can be worn with almost every outfit (Kevin bought me a pair a few years ago and I wear them all the time!). If you want to step it up a notch, diamond hoops or drops are also great, affordable options. A gift of jewelry is bound to make an impression without leaving one on your bank account. For other great gift ideas, check out the selection of rings by Anjolee.